Reassuringly solid. Designed for maximum durability, this practical slimline design still manages to exude elegance with its smooth, curved panels and contemporary feel. One of the Aeon Aluminium range. 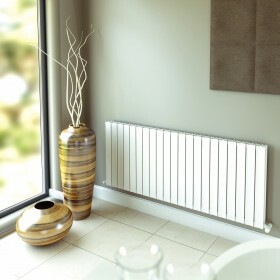 Aeon Luvre radiator- lowest UK price with free delivery, (* See terms ) Aeon accredited retailer. Aeon stainless steel designer radiators. Designed for maximum durability, this practical slimline design still manages to exude elegance with..